Decorate your own sweet treats with deliciously scented markers and stickers throughout this fun-filled coloring activity book! 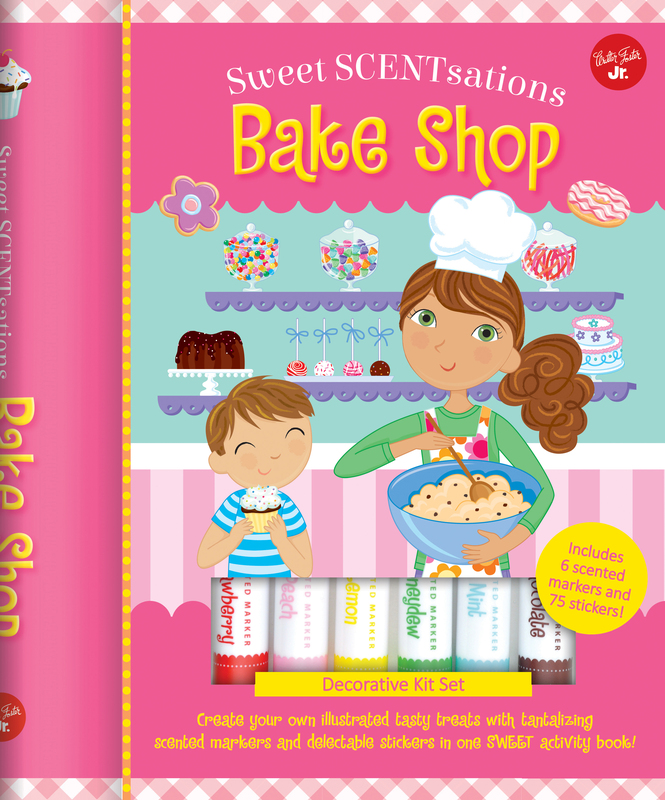 Decorate your own sweet treats throughout this fun-filled coloring activity book! Whether children are decorating a seven-tiered cake or adding colorful sprinkles to sugar cookies and snickerdoodles, they will quickly discover how easy it is to explore and push the boundaries of their creativity--all that's needed is a little imagination! With 48 pages of open-ended prompts and unfinished illustrations that encourage the use of scented markers and scratch and sniff stickers, children will stay busy for hours frosting doughnuts, cupcakes, and other delicious desserts just waiting for their creative help. Each kit comes with a set of deliciously scented markers, including strawberry, chocolate, mint, and lime, to make all of your dessert creations and treats smell extra yummy! Designed to encourage artistic exploration and imagination in a sweet-smelling, creative way, Sweet SCENTsations: Bake Shop is sure to inspire children of all ages. The Walter Foster Jr. Creative Team develops fun and imaginative books and kits for children of all ages. Encouraging learning and exploring, Walter Foster Jr. titles cover a wide range of subjects, including art, transportation, history, craft, gardening, and more. Walter Foster Jr. is a division of Quarto Publishing Group USA Inc., a subsidiary of the London-based Quarto Group, Inc.